Most of the projects we support are quite small scale local initiatives. They often complement other work that is being done. Whenever possible, they lead to other things, through the training they provide, or the ideas they generate. We also fund travel and expenses when the benefits to peace building work in Africa are clear. Attending a conference, giving a presentation, participating in a key workshop, or doing a speaking tour to raise funds, are all possible examples. My name is UMUTONIWASE Claudine, I am 30 years old, girl from Kicukiro. I begin by greeting you and wishing you peace from God. I am the second child in my family. After my secondary which I completed in 2008 in Human Sciences. Since that time I didn’t get any job up to 2015. Then I decided to join Mwananshuti Vocational Training Center in Cooking option. Now I know how to cook different kind of food nowadays some people come to me and request to me to help them in preparing the food for the meeting, wedding, … Some Hotels and restaurants accepted to hire me after my internship. I thank so much Mwananshuti Leadership and the donors who help a lot for the Mwanashuti success. HROC workshops for people with disabilities, aimed particularly at vanquishing the conviction that their disablilites must in some sense have been ‘deserved’. Work with female victims of sexual violence, helping them to resist prejudice and discrimination. 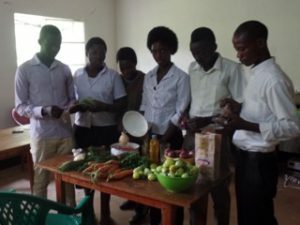 Bududa trains young adults in vocational skills and also has a school for orphans.